Four Roses Distillery had quite a set-up at the Kentucky Bourbon Festival Gala on Saturday night in Bardstown. 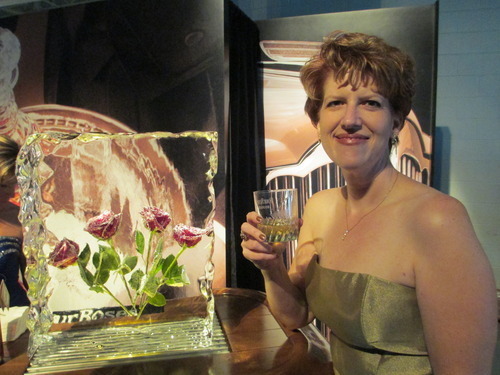 Here, I’m enjoying a glass of Four Roses Single Barrel while standing next to a sculpture that captured the brand’s iconic blooms in ice. Four Roses employees who weren’t pouring were busy pinning roses on gentlemen’s lapels and applying temporary Four Roses tattoos on ladies’ arms and shoulders. Master distiller Jim Rutledge was greeting fans and posing for photos. Like most master distillers, he spends a lot of his time outside the distillery, educating the public and representing the brand. But that’s OK with him – spreading the Four Roses gospel is one of his favorite parts of a job he worked a long time to secure. Many thanks to Jim and to Four Roses for hosting me at the Gala!